Researchers have developed an accurate diagnostic score that consists of inexpensive blood tests to identify patients who require immediate treatment against the deadly hepatitis B virus – which can lead to liver damage or cancer (1). The score consists of two simple blood tests: one measuring the presence of antigens, proteins produced by the virus, and another for enzymes produced by the liver in response, to accurately assess patients for treatment. The score was found to be as accurate as existing methods for identifying the patients in need of immediate treatment but at a fraction of the cost, $20 compared to $100-500 for current tests. 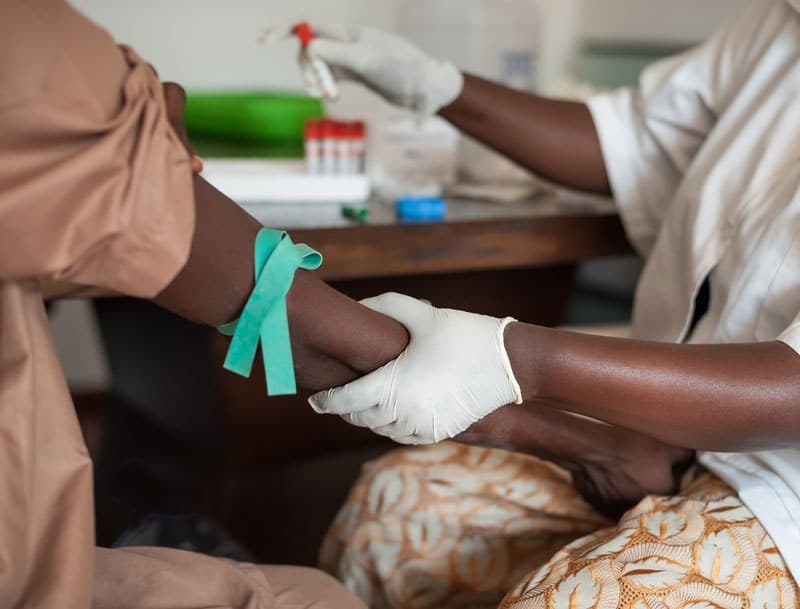 It is also far more accessible than existing methods – such as liver biopsy or HBV DNA, a much more complicated blood sample analysis – which requires resources and laboratories that are not always accessible in sub-Saharan Africa. Researchers from Imperial College London and Medical Research Council Unit The Gambia at the London School of Hygiene & Tropical Medicine, collaborating with the Pasteur Institute in Paris and other African and European institutions, used data from hundreds of hepatitis B patients in The Gambia who were part of the PROLIFICA (Prevention of Liver Fibrosis and Cancer in Africa) study (2). The tests were then validated with data from African patients in Senegal, Burkina Faso, Germany, France and the UK. The results are published in the Journal of Hepatology. The new diagnostic test, called TREAT-B, was found to accurately identify HBV positive patients who require treatment in 85% of cases (called sensitivity), and could accurately identify those who do not need treatment in 77% of cases (called the specificity). The scientists say that further research is needed but if the test is successful in larger studies it could be used widely to identify patients in need of hepatitis B treatment and refer thousands of people for life-saving treatment. The test could also be developed further to be implemented as a finger-prick test, similar to those used to detect HIV, to get quicker results. The researchers also discovered that the diagnosis method worked at all stages of the disease – meaning that people in the early stages of liver disease without symptoms could also be screened and identified. Imperial’s Dr Maud Lemoine, co-author of the study, said: “These results show that this simple and inexpensive test could be an accurate way to diagnoses patients in need of hepatitis B treatment in countries with limited resources. Viral hepatitis is a major global health problem and in 2013 an estimated 1.45 million people died from the virus. It is the seventh leading cause of death worldwide and about half of deaths are attributable to the hepatitis B virus infection. The hepatitis B virus infects around 250 million people worldwide, and is transmitted through blood and bodily fluids. In Africa, it is commonly transferred from mother to baby during birth or between children. However the virus causes no immediate symptoms, and can remain undetected in the body for decades until triggering severe complications such as liver damage (cirrhosis) and cancer. The MRC Unit The Gambia at the London School of Hygiene and Tropical Medicine, the National Public Health Laboratory, the European Commission (European Community’s Seventh Framework Program, FP7 grant 265994) and the Gilead Sciences (USA) for providing tenofovir treatment. The study in Senegal was supported by the Agence National de Recherche sur le Sida et les Hépatites Virales (ANRS).